What’s your bike to you? Is it a tool, a means to an end, a piece of transport? Or is it the love of your life, a hunk of metal and plastic you’ve imbued with a soul? Something you hankered after for years, finally managed to possess, and have made your own with tweaks, customisation, stickers? For most of us it’s probably somewhere in between. But I bet if you told me what the bike was, I’d get a pretty accurate guess as to its position on that scale. A rebuilt Suzuki RGV250? Probably not just there for picking up the shopping from Tesco. Turbocharged GSX-R1000? Original 916 Monoposto? Kawasaki H2 (old or new)? Again, unlikely to fall into the ‘white goods’ category in your head. 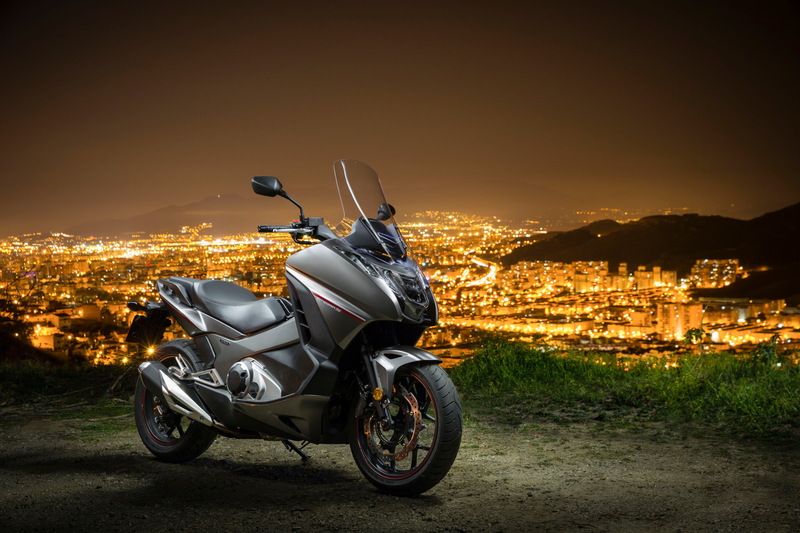 What about the bike I’m in Spain to ride today, Honda’s NC750X? I actually know a couple of folk locally who do own one of these, and it’s fair to say that they’re more ‘purposeful tools’ than ‘prized trophies’. Inside London’s suburbs, you can get onto something like this, insured and kitted up, for less than the cost of a Zone 5 season ticket (£2,200 a year…) And plenty of folk do: the lure of a 750cc Honda, with backup from one of the firm’s suburban dealers seems like a killer deal, and the mate-of-a-mate who owns one couldn’t knock the sense it makes. So we’re here in Spain to try out the updated 2016 version, which should, in theory, make even more sense. It’s not an enormous update: the engine is largely unchanged, and the chassis changes aren’t massive either. 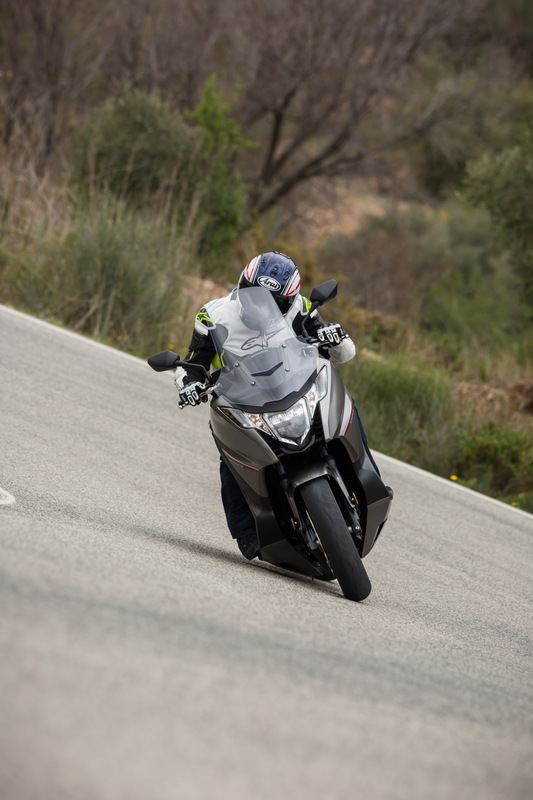 That means the headline figures stay at 54bhp, pushing a 220kg bike (10kg extra on the automatic transmission DCT version). 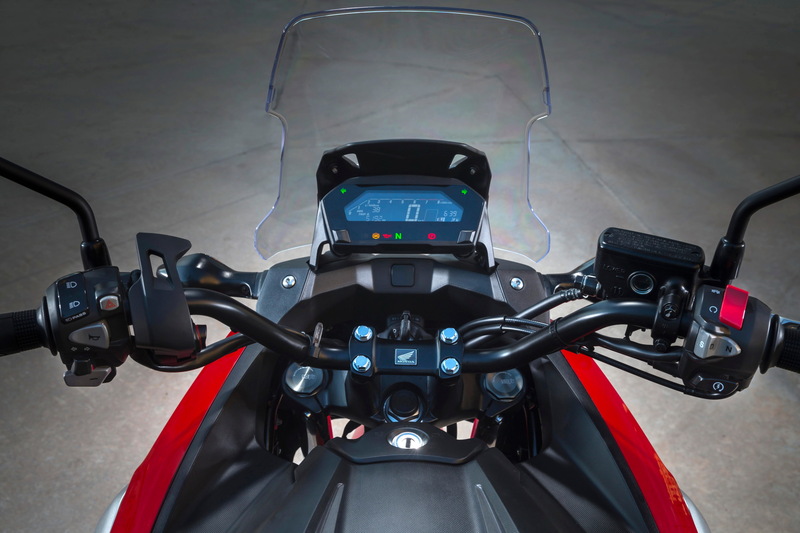 Engine-wise, it’s got new software on the DCT computer, adding three levels of ‘S’ sport mode, and a higher rev limit for manual downchanges. Oh, and an even bigger catalyst in the new exhaust for Euro-IV emissions. On the chassis front there’s a new Showa fork, preload adjustment on the rear shock, and a revised front caliper. It’s the bodywork design that’s had the biggest revision though. 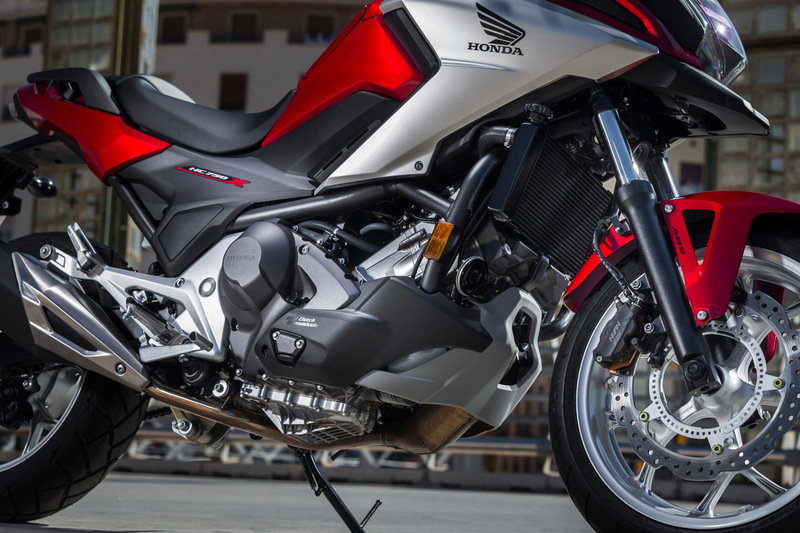 There’s new ‘X’-styling, to make it look like the Crosstourer, Crossrunner and CB500X family. You also get a taller screen, bigger storage space under the ‘tank’ area, and LED headlights and tail lights. Fair enough, if not the sort of stuff you’d be gassing about at the Bike Shed Café. 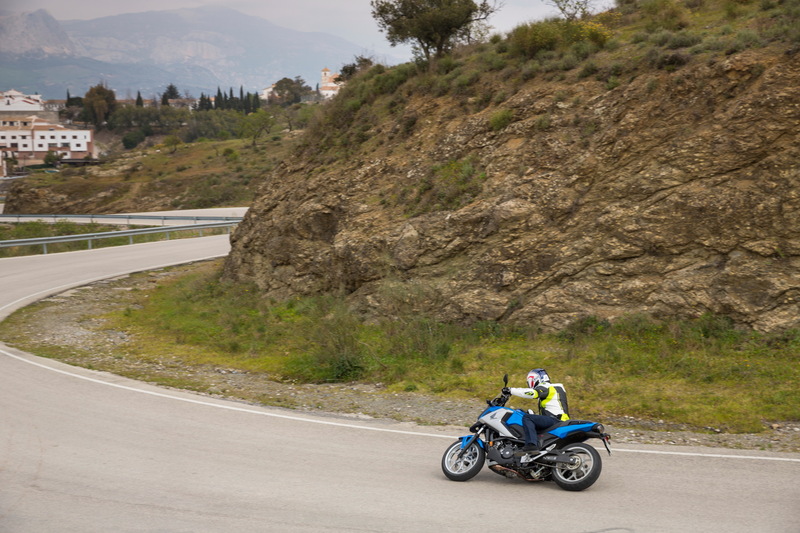 But I’ve got an open mind as we set off on the mountain roads up the back of Malaga for a spin on the new NC. We spent the morning riding the scooter-styled Integra version of the NC (see below), so I’m used to the engine by now. We’ve also only been given the DCT bikes to ride today, so the scooter-feeling remains strong, although it’s quite clearly a ‘proper’ motorbike we’re on. Albeit a proper motorcycle that’s a bit short on cojones. The NC engine is, as we probably all know by now, based on half of a Honda Jazz car engine. 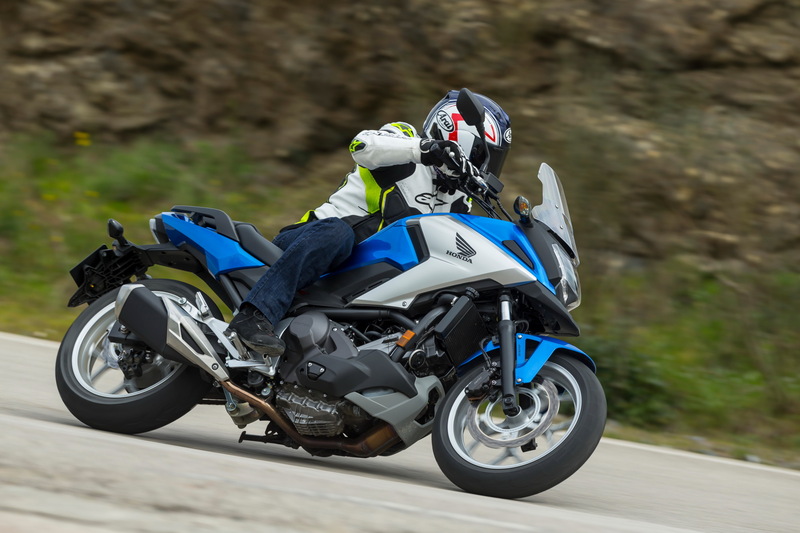 The original version was a 670cc parallel twin, with a single overhead cam, eight valves and 51bhp, and this 745cc update came out a couple of years back, with ten per cent more power and torque. Fifty-four of your actual Japanese horsepower isn’t a lot these days, and you are paying a lot in terms of power, on paper at least, for the cheap running costs you get in return. We’re getting the most out of what we do have though. I’m chasing Mr Chris Moss down a Spanish mountain backroad, and the throttle cables are getting a proper stretching. The rev limit is legendarily low on the NC, and the clever DCT transmission is hard at it, changing up like a 125GP racer. I’m playing about with it, and find the best solution for me is to have it in ‘S3’ mode, the most ‘sporty’, but to add my own extra downchanges on the way into bends, to give a bit more engine braking and get the revs up. Every now and again though, the box would change back up again, the cheeky monkey! And suddenly you’re sailing into the first part of a bend with no engine braking and the motor burbling away under you. Play by the rules though, and there’s no danger of anything going wrong. Treat the NC like a big scooter, albeit with good brakes and proper suspension, and you can have a bit of fun. I wasn’t filled with love for the Dunlop Battle Wing tyres: on the cool, smooth Spanish Tarmac they gave little confidence once you started to lean over, and the back was easy to unhook, even with the ABS system. A combination of an older, cheaper design, with the compromise inherent in a ‘trail-styled’ tyre used on the road is all a bit much here, and I’d be swapping these out ASAP, even just for UK commuting. The rest of the chassis is sound though. 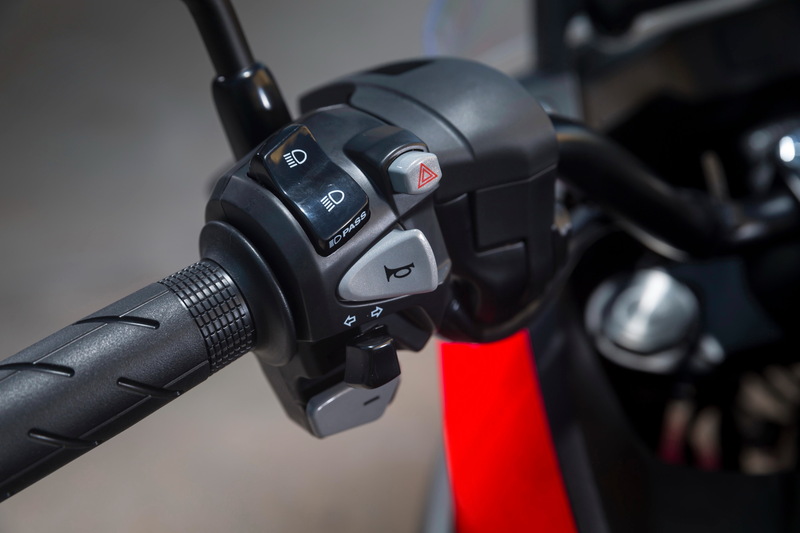 There’s not a lot of power to work against of course, and the sliding twin-piston caliper and single front petal-type disc is fine for anything that’s likely to be chucked at it. The new Showa Dual Bending Valve fork claims to give much of the benefits of a cartridge fork in a cheaper, lighter, damper rod design. And in terms of a budget, unadjustable road bike unit, it works well, giving more plushness and control than you might expect from such a low spec. The pegs go down eventually in a bend, but neither the bike nor me enjoyed that very much. Better tyres would certainly have you making gentle sparks on the local roundabout though, should you fancy such things. On the way back to the hotel, we take a faster, more sweeping route, and explore the NC at higher speeds. The new screen is 7cm taller, with clever slits and ducts to smooth the airflow. I’m not very tall, and was reasonably well protected from the wind, but if you’re much taller than 5’8″ you might end up in the breeze a bit more. 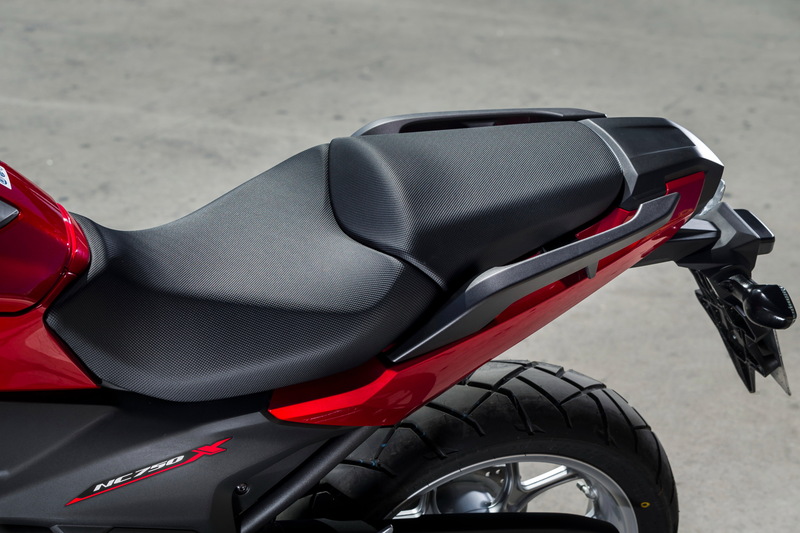 I found the seat and the riding position comfy enough, and with some heated grips fitted, I think it would be a sound spot to kill some miles from. The LCD dash is clear enough, with weird colour changing modes that seemed a bit gimmicky to be honest. There’ s plenty of info though, including a weird ‘Today’ display, reminding you of today’s date. Knowing the date is useful, no doubt, but it probably doesn’t need to say ‘Today’ next to it. You wouldn’t suspect it was telling you what the date was yesterday, or will be in ten days’ time, would you? We’re back at the hotel now, and the NC750s all look great parked up ready to go back to base. I’ve not really been convinced, though, that the new bike is much more than the useful tool it is for my mate back in London. 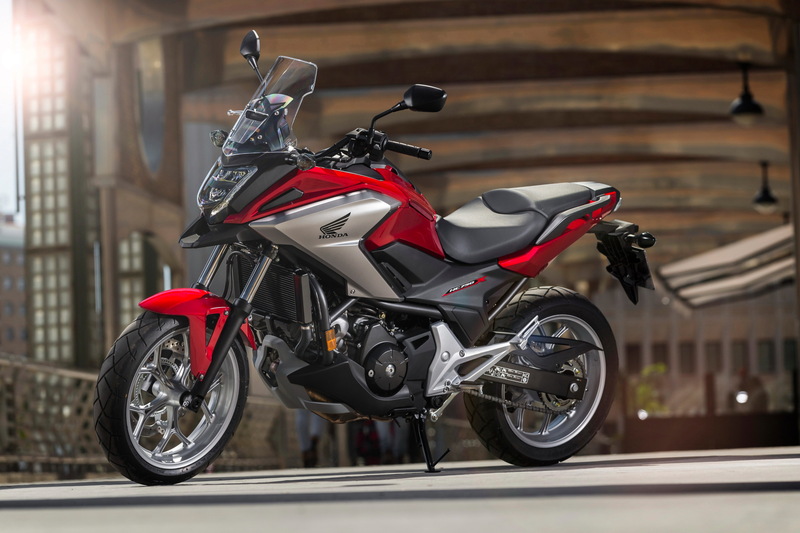 Honda reckon you can use it for weekend fun, and while it’s true that any bike is going to be more of a laugh on a Sunday morning than a full Oyster card, it’s also true that there are plenty of far more engaging bikes available out there. 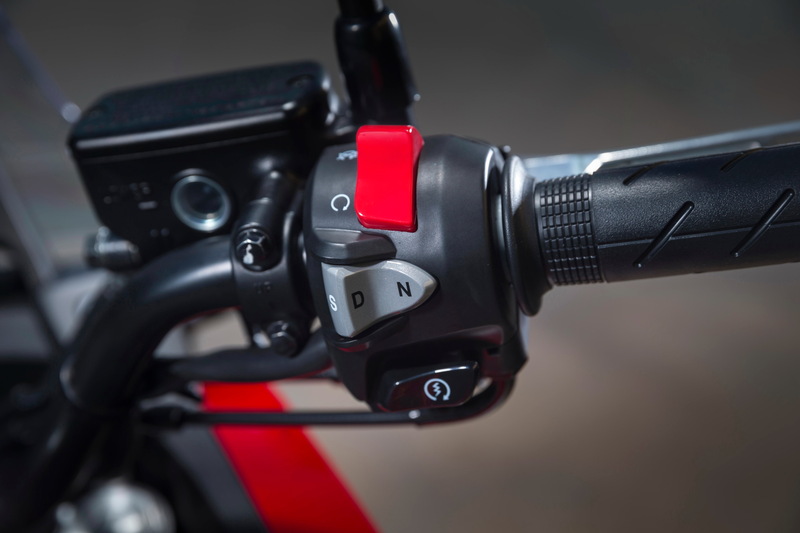 The DCT works well, no doubt, and Honda’s clearly very keen on it – the organisers hadn’t even brought any manual bikes to the launch. 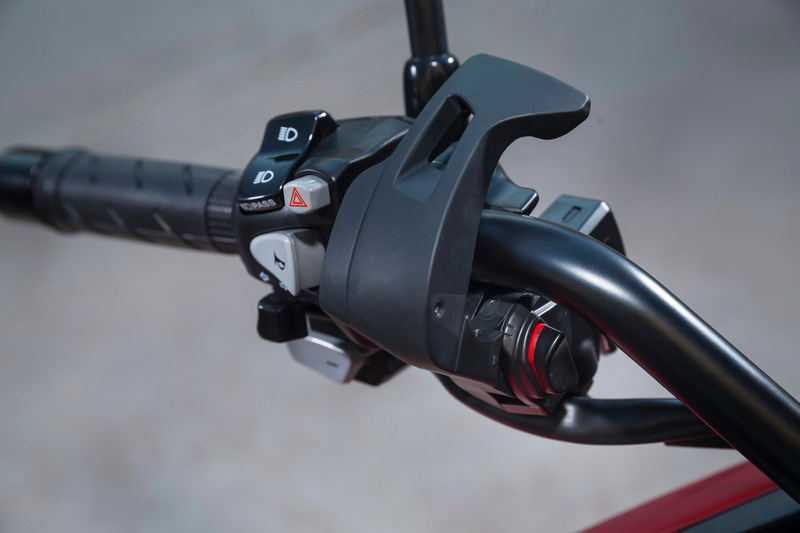 But it’s a lot of weight and complexity (and £150 more), and with competitor firms coming up with excellent up- and down- quickshifter systems, much of the advantage in terms of dynamic performance has been rendered moot for me. The claimed ‘adventure’ elements to the NC are cosmetic: like a Honda CR-V or a Nissan Qashqai, say, it’s got mild offroad styling, but next to no performance advantage over a normal naked road bike. None of this will put off Honda, or the NC’s intended customers though. At just over £7k for a brand-new ‘onda complete with fancy DCT transmission, it’s a reasonable proposition. Add decent tyres, hot grips, some hard luggage, and you’d have a solid middle-distance commuter, for your couple of hundred quid a month finance deal. The Integra is part of that unloved category in the UK, a big-bore automatic scooter-bike. 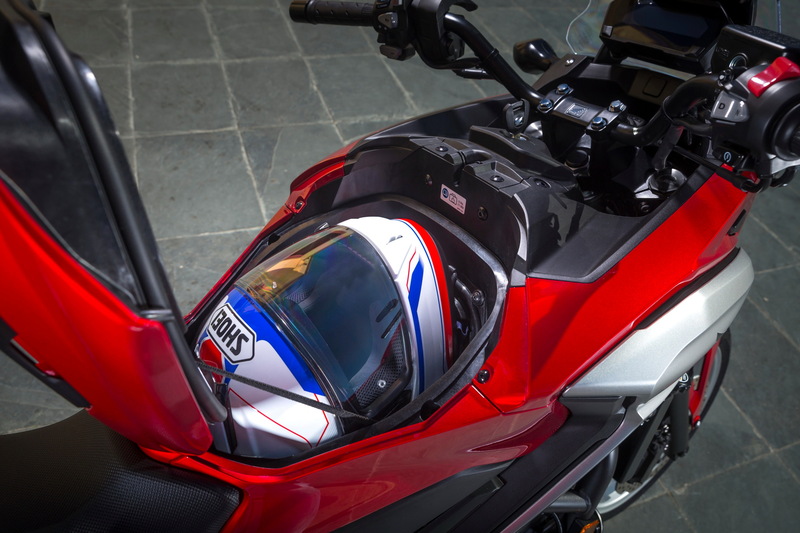 It’s been designed to have a sort-of step-through design, with the same engine and chassis setup as the NC750X. On the move it’s decent enough: fifty-odd bhp is in the ballpark for a big scoot, and the big wheels give you far better handling than you get on a ten- or 12-inch rimmed scooter. 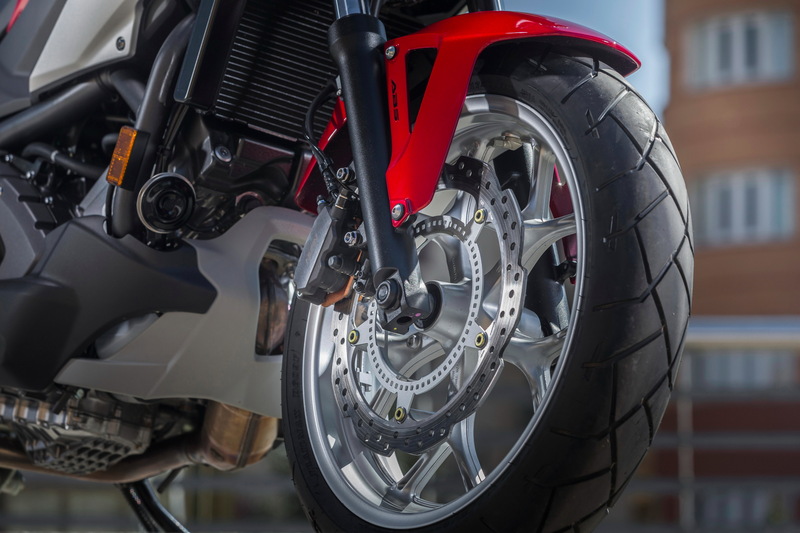 The Bridgestone T30 tyres were good, possibly better than the Dunlops on the NC750X in terms of grip and feel, and it has stacks of ground clearance. Sadly though, it falls down badly in pracitality terms. 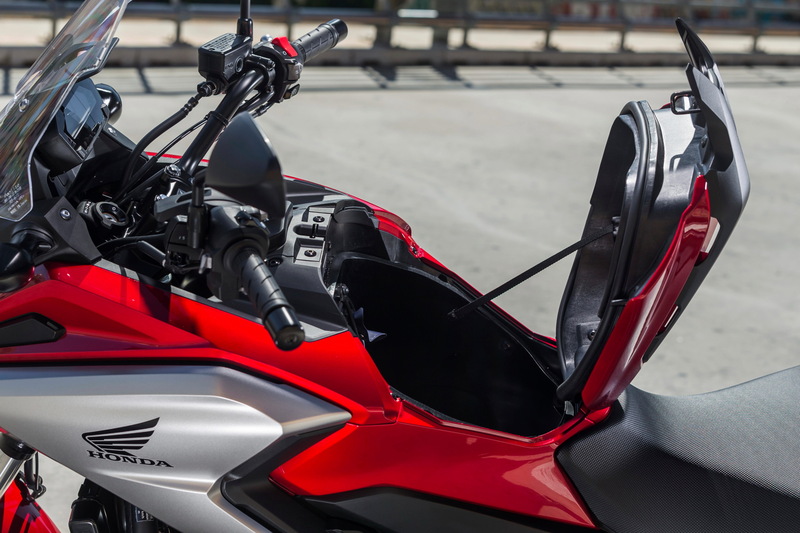 The big wheels mean far less underseat storage space, and compared with something like a Burgman 650, there’s hardly any room under there. 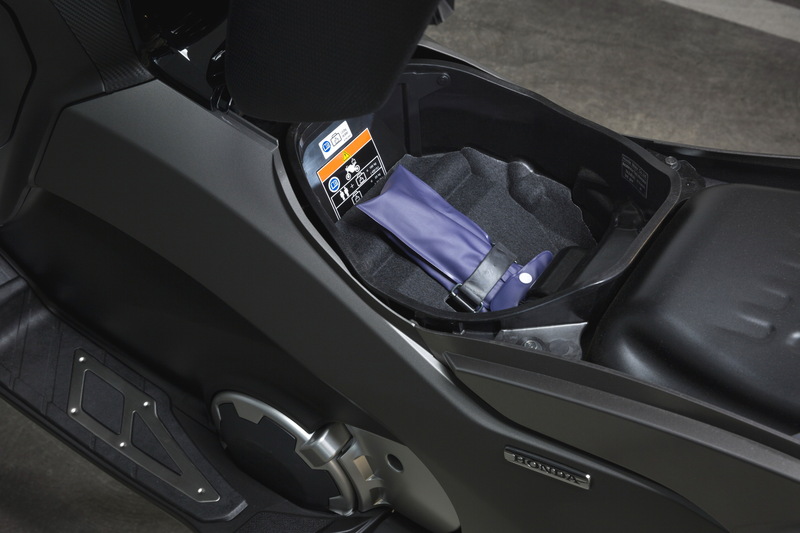 It’s far smaller than the NC750X’s under ‘tank’ space, and even my old ZRX1100 has a bigger underseat storage space. That’s a killer flaw for me, and means you’ll need to have a top box fitted at a minimum for usability as a commuter. New caliper, natty wave disc work well. Tyres are a bit meh.